Notre Dame, Ind. — Keysha Streater was 10 points shy of becoming the Holy Cross College women’s basketball all-time scoring leader, coming into Wednesday’s game against Robert Morris University. Streater broke the record scoring 17 points in the game, surpassing Lindsey Steffen (2010-2014). She now has a career points total of 1,716. Streater, from Sapulpa, Oklahoma, is a senior and a two-year captain on the women’s basketball team. For her career she has averaged 14.7 points per game. Keysha made an immediate impact for the Saints in her debut season, averaging 11.1 points and 5.6 rebounds. In her sophomore year, she averaged 14 points and 7 rebounds, and was named to the Chicagoland Collegiate Athletic Conference’s Honorable Mention All-Conference Team. 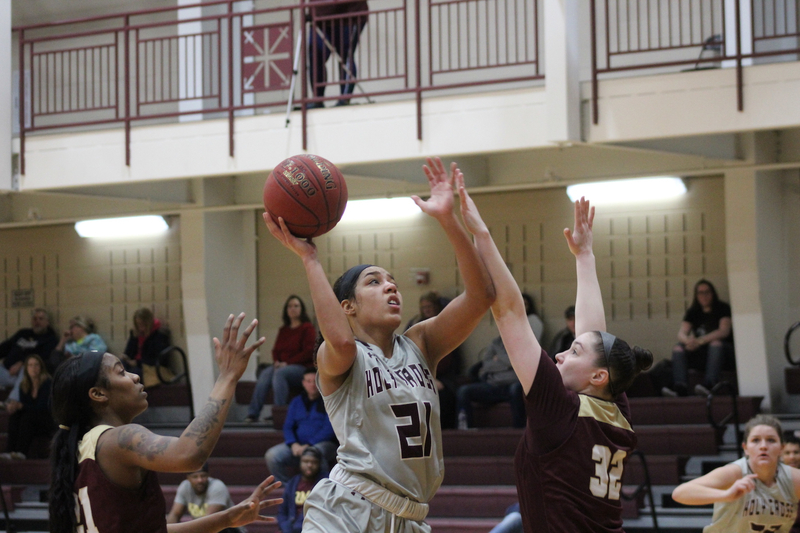 Last season, Keysha was also named CCAC Honorable Mention All-Conference while averaging 16.1 points and 7.9 rebounds. Currently the Saints are 13-14 on the season, behind Streater’s 17.2 points per game and 7.4 rebounds. Keysha also ranks first in the Holy Cross College women’s basketball career record book with field goals made (697), field goal percentage (58.4%), and games started (110). In Wednesday’s game, Streater wasted no time setting the career scoring record. After the first half, Keysha had tied the school record, scoring nine points. Forty seconds into the second half, Keysha was fouled inside, and went to the line. She converted her first free-throw, to give her 1,709 career points. She would finish the game with 17 points, giving her 1,716 points with three regular season games to play.